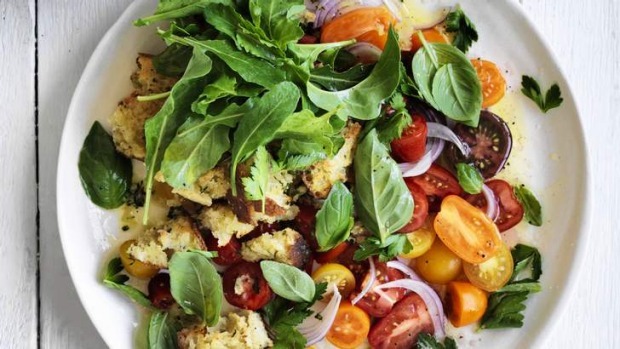 As the weather warms up, this salad alternative using traditional garlic bread is just the ticket. Preheat oven to 200°C. Mix the butter, garlic, shredded parsley and 1 tbsp of the olive oil together and toss through with the bread until it's coated. Season with salt, spread on a baking sheet and bake for about 8 minutes until the bread is well toasted. Mix the tomatoes, onion and leaves together and toss in the remaining olive oil and red wine vinegar. Combine the bread with the salad, toss again and season with a little more salt and plenty of pepper.